locations. 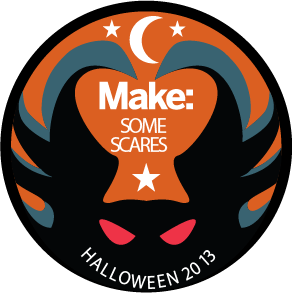 So for this Halloween, I am doing a series of projects that demonstrate different sensors that can be used to automate a haunted house. Last week I showed how to use a pressure plate switch to activate special effects. This week, I am going to show you how to make a simple proximity sensor. This is basically just an infrared LED and a phototransistor. When a person stands near the sensor, some of the light from the LED is reflected back to the detector. The output signal of the detector can be monitored by an Arduino and used to activate special effects when the person is close enough. Here’s the project on MAKE: Projects and Instructables.